I love fun crafty foods around the holidays – especially easy ones. Here is a cute one that the kids will love. Melt chocolate in a bowl using the double-boil method or microwaving in 20 second intervals and stirring. Dip 16 pretzel sticks in chocolate and let cool on wax paper. When firm, stick 4 sticks into each side of the ring ding pointed upward. Using the melted chocolate as a joint compound, dab a glob of melted chocolate on the "elbows," and attach another pretzel stick facing downward and outward onto the leg. Repeat this step for all 8 legs. Lastly, adhere candy eyes with melting chocolate to front of spider, and dab a small amount of chocolate in center for pupils. These are so fun to make and tasty to eat! 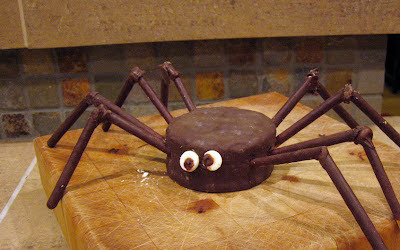 If you make these this year, please post your photo on our facebook page!